A woman made no attempt to hold back her anger after her daughter was refused permission to pet a service dog. Now I’m all for petting dogs, but of course it’s nice to get the owner’s permission before you do so. As for service dogs, it’s common courtesy and a good general rule to leave them alone, especially when they’re wearing their working vests. Their need to do their job is greater than your need to stroke them, even if it’s a truly burning desire. Which it usually is. Unfortunately the owner of this particular service dog has found a lot of people still ask to pet it even when it’s clad in ‘training dog’ signs. To avoid any dragged out conversations the owner has decided to get straight to the point and just say ‘no’ when people ask, but the woman in this video did not think that was an acceptable answer. The video was filmed in Pennsylvania and shared online by ML Leigh, who explained people usually accept the refusal to stroke the pup without argument. Obviously this woman was an exception. After the mother had been turned away she came back with her child under her arm and proceeded to argue that the handler could have been more polite with her response, and that there should be a sign to warn people they can’t stroke the dog. Which might have been a valid argument, if the hard working animal apparently wasn’t already wearing signs saying ‘don’t pet’. She spent a good minute or so fighting her case, though the daughter didn’t even seem that bothered, to be honest. If she’d been screaming and crying I could maybe understand the mother wanting a more sympathetic explanation, but the child seemed happy enough just looking at the furry workers from a distance. 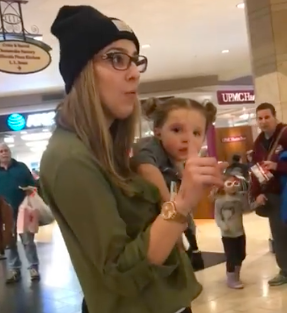 In fact it was the mother who apparently started crying as a result of the situation, and she even got mall security involved. It seems like maybe she was the one who wanted to stroke the dog, and was just using her child as an excuse. Had this crazy experience yesterday at the mall where some lady asked if she could pet the dogs. People ask us all the time so I just said, “no”. All the dogs are working so it’s my go to answer. And they walked away. No big deal right? And we should “have a sign or something.” You mean the 20 patches on my dog that say don’t pet? 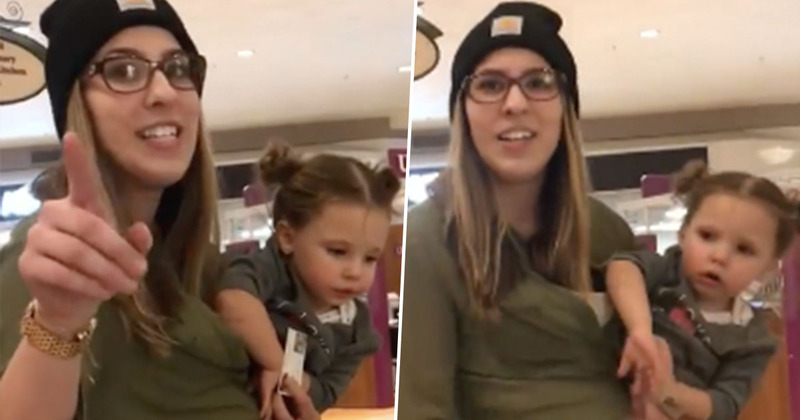 The video has since been viewed over 2.5 million times, and many comments show their support for Leigh and claim the blonde woman was being entirely unreasonable. Hopefully she’ll know to leave service dogs and their handlers alone from now on!